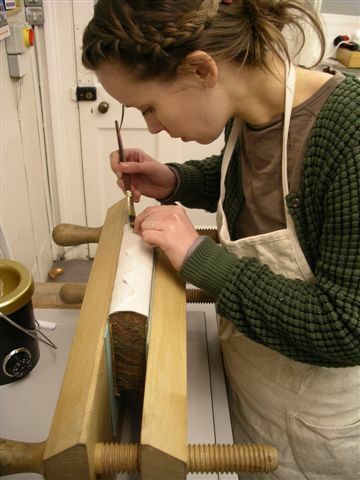 Lucy did an MA in Conservation at Camberwell College of Arts, where she specialised in book conservation, starting on small projects and practising different techniques essential in the profession, which was extremely useful in building her confidence. Several classes were taught by professional conservators. She particularly enjoyed the one on methods of Islamic bindings, an area where she would like to broaden her experience. Lucy's final practical project was a severely damaged 17th century bound manuscript copy of official documents to certify the lineage of a certain family of Spanish nobles. “It was extravagantly bound in beech boards covered in pink velvet, and the pages were elaborately decorated throughout.” She also carried out a number of work placements at the College of Arms and the Wellcome Trust, both of which were extremely useful. Having graduated with a distinction Lucy got a short term contract at the Wellcome Trust, preparing a fire damaged archive for cataloguing. She was applying for internships as she felt that this would be the “most beneficial way to continue to develop my practical skills and gain further experience of a professional conservation environment”.